Part 1 of the report provides an overview of the position of energy-intensive industries in Romania as compared to other Central and East European economies. The industries identified as particularly ‘energy-intensive’ are the paper industry, the chemical, the non-metallic mineral products and the basic metals industries. The countries selected for benchmarking are the Czech Republic, Hungary, Poland, Slovakia and Bulgaria. The comparison includes production, employment, productivity and investment including foreign direct investment in the respective branches. 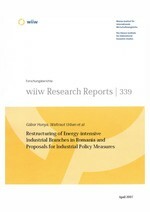 Part 2 presents a more detailed analysis of the most energy-intensive sub-branches (pulp & paper, basic chemicals, glass, ceramics, cement, iron & steel and aluminium) focusing on major performance indicators such as value added and foreign trade developments; also included is information on the ownership structure, status of modernization, compliance with the acquis and the further demand for restructuring. Part 3 points out the demand for and possibilities of policy support for the energy-intensive branches in Romania with a view to EU membership. A special focus is on sectoral issues (steel and basic chemicals), energy pricing (electricity, gas), regional, labour market and environmental issues.